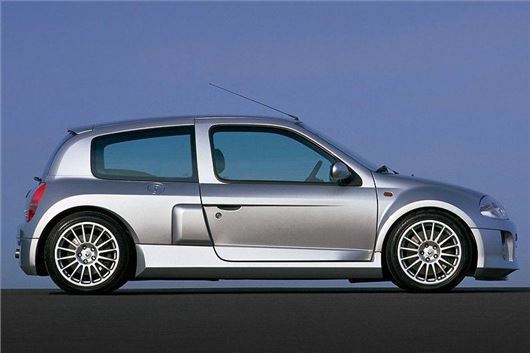 Introduced in 2000, the mid-engined V6 Clio was a precursor to the far more conventional Renault Sport Clio 172 that would follow, and not all that much quicker. But it was built to trade off Renault’s reputation in Formula One racing, and the use of a mid-mounted V6 engine and rear-wheel-drive were all very much part of that. Indeed, has the Clio V6 been a one-off PR stunt, we’d have understood it far better. But it wasn’t. The crazy Clio was actually a production car, and one that made very little rational sense. It featured an exploded Clio body shell, with fat wheel arches and bulky side skirts, mounted on a bespoke rear-drive chassis, with the 3.0-litre V6 from the range-topping Laguna mounted transversely behind its own bulkhead, and fettled to include enlarged inlet ports, new pistons, a revised air intake and a higher compression ratio. In such form it developed 230bhp, and gave the Clio V6 a 0-60 time of less than six seconds. The engine was also left uncovered so that the driver, once he or she had clambered over the ridiculous side sills and strapped themselves into the racing bucket seats, could appreciate its aural accompaniment at full-chat. The V6 Clio was not a car for the faint-hearted, then, nor was it one that you’d buy for any of the other reasons you’d choose a Clio. It was brash, unwieldy to drive, had a ridiculously bad turning circle, nigh-on zero luggage space, a hard, unforgiving ride and unpredictable handling when pushed hard. It was also ridiculously expensive, which meant there was absolutely no rational reason for buying one. And that, in our book, makes it an instant classic. After all, if a car has been put into production simply because the designers and engineers that created it wanted it to be built, then it’s a vehicle that has clearly been dreamed up by petrolheads. In the case of the Clio V6, the petrolheads were split between Renault itself and Tom Walkinshaw Racing (TWR), which was tasked with building them. The cars were a spin-off from the Renault Clio Trophy race series and were assembled by TWR at its Udevalla plant in Sweden, at least until TWR itself folded in 2002 with insurmountable debts. But that wasn’t to be the end of the Clio V6. Instead, production transferred to the Renault Sport (formerly Matra) plant in Dieppe, France, where a Phase Two model was introduced, using the same revised headlamp and taillight clusters as the facelifted mainstream Clio. Power was upped to 255bhp and the chassis setting altered, offering better damping and less jitteriness on uneven surfaces, but the car was still a handful.